I was once asked to list my favorite PPC mistakes. To me, this seemed like a contradiction in terms; I don’t hold any of the mistakes I’ve made in particularly high regard. Perhaps a better phrase to use would have been common PPC mistakes. Because mistakes, no matter how hard we try, are common. We’re all human and therefore capable of human error. And the world of PPC is rapidly evolving with new, ever more sophisticated features and updates. With all those shiny new bells and whistles to explore, it can be easy to forget the basics. Here I take a look at what I’ve found to be the most common mistakes in PPC accounts, along with some guidance on how to avoid them. There are two main categories into which the mistakes I’ve listed below could fall: accidents, or misuse of best practices. Accidents are the result of human or occasionally technological error, where there is no question that a mistake has been made. On the other hand, some readers may find themselves disagreeing with some of the best practice “mistakes” I’ve included in here. A lot of people run PPC campaigns differently, whether we’re comparing agency-level best practices or individual account management techniques, but I believe avoiding the mistakes I’ve listed here will benefit the overall health of your campaigns. Many people — including Googlers — would disagree with me here, but I think using broad match is a mistake. When auditing or taking over new accounts, it’s consistently the biggest cause of wasted spend and irrelevant traffic. It simply doesn’t provide you with enough information about a user’s intent to serve them the most appropriate ad. Even if we take ridiculous search queries out of the equation for a second (I once saw a search for “margarine” matched to “body butter” in broad match), there are still problems. Broad match leads to regular cross-matching between ad groups. 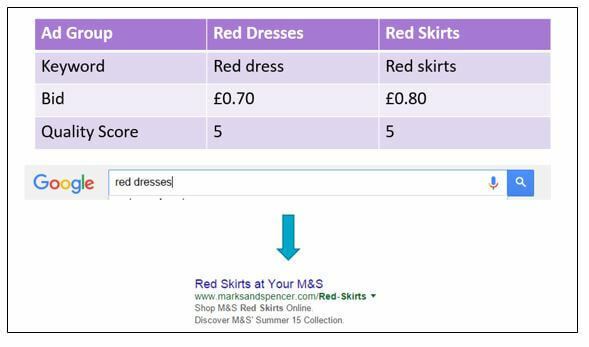 The example below shows how a search for “red dresses” could trigger an irrelevant ad for red skirts. The keyword “red skirts” has a higher ad rank than “red dress” and is broadly related to the search query “red dresses.” This means the user is served the wrong ad, meaning they’re less likely to click through — and if they did, they’d end up on the wrong landing page. Of course, adding “red dresses” as a negative keyword to your “red skirts” ad group could solve this problem, but that would be incredibly time-consuming across all keywords and ad groups. And it could be avoided altogether by using phrase match. The mistakes it’s possible to make with audiences could fill an article themselves, but there are a few that regularly pop up in account audits. “Target and bid” means that only users who are in your remarketing lists will see the ads in this ad group. This is a great option to choose if you’re bidding on terms that would usually be too expensive, and you want to limit your exposure to a narrower audience — or if you want to serve specific ad messaging to previous visitors. “Bid only” is the right option if you just want to adjust bids for previous visitors in response to performance. It is incredibly easy to make the wrong choice here or accidentally leave the default setting of “Bid only” enabled. This could result in either a sudden drop in traffic and revenue from a key area or huge spend where you weren’t expecting it. So make sure to double-check this for every ad group. A robust remarketing strategy, whether in search or on the Google Display Network, will most likely involve the creation of multiple lists, many of which could overlap with others. An “All Visitors — Last 30 Days” list, for instance, will contain the users that also sit in the “All Visitors — Last 7 Days” list. That in itself is not a problem, but when it comes to creating your campaigns, you need to remember that ideally, you only want a particular user to be targeted by one ad group. Otherwise, your data is meaningless, and you could end up paying more for users than is necessary. This means always excluding shorter/more granular lists from ad groups that are targeting broader audiences. So if you have two ad groups, one targeting visitors from the last seven days and the other visitors from the last three days, make sure exclude your three-day list from your seven-day ad group. If your two ad groups are product viewers and basket abandoners, exclude the basket abandoners from the product viewers ad group. 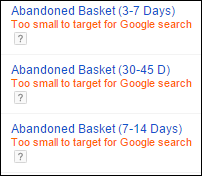 Everyone who’s abandoned a basket must have viewed a product before that point, so no need to target them twice. You need 100 users in a remarketing list to use it for GDN activity and 1,000 to use it for search. Outside of those limits, it’s pretty much up to you. But it’s all too common for people to get carried away building every list they can think of without considering what size they could be. Many end up too granular and are unusable in search campaigns, in which case you need to stretch out your durations or look at less granular audiences. There probably isn’t a need for a list of people who abandoned a DVD in their basket last Tuesday — the last 30 days might do. Conversely, that robust remarketing strategy I mentioned above does require the creation of multiple lists. The results you’ll see from a user who visited your site and bounced straight off 29 days ago will differ hugely from results from someone who abandoned their basket yesterday; don’t just target them all with a blanket bid and creative in one ad group. Let the volumes of traffic that you’re seeing on the site indicate just how granular you can afford to go with your remarketing lists. And make sure to check on and react to list volumes, rather than letting redundant lists languish in your account. This one is the source of much debate among PPCers: standard or accelerated delivery. Do you set a daily budget and let Google decide how to distribute that budget across the day to ensure you’re on all day? Or do you allow your ads to serve as often as possible, even if that means your daily budget runs out at 9:00 a.m.? At first glance, option one seems better; but when you think about it, what does that option really mean? Let’s simplify for the sake of argument and say your campaign budget is £24/day, and your bids are set at £1. If Google estimates you’re going to gain one click per hour throughout the day, it may only serve your ad, say, 30 times per hour. But what if 1,000 searches are occurring for keywords in that campaign every hour? You’re missing out on 97 percent of them because Google has decided you can’t afford it, and you have no idea how valuable those impressions could be for your business. On the other hand, if you were using accelerated delivery, then learned the day after you launched your campaign that your budget had run out after the first hour, you could take action. Clearly, you need to decrease your bids or increase your daily budget in order to appear for the entire day. Standard delivery creates the illusion that you can “afford” to be appearing all day. But you can’t — Google is deciding when to show your ads instead of you. Whichever delivery method you choose, you run the risk of spending beyond your means. But accelerated delivery alerts you to this fact much more quickly and puts the control back in your hands. Sales don’t always occur between the hours of 9:00 a.m. and 5:30 p.m.; even if they do, it may be in a completely different time zone. But thanks to automated rules, there’s no need for anyone to be up until 11:00 p.m. on Christmas Eve making ad changes. It can all be set up to run in your absence without a hitch — as long as you’re careful. 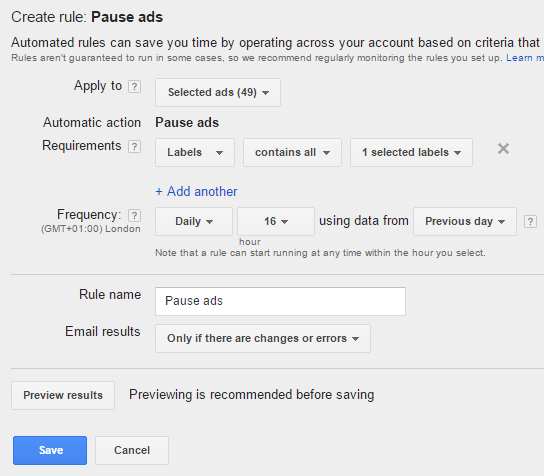 Are you applying the rule to selected ads or to all ads in a campaign? Should the rule be limited to ads with a specific label? Is this rule running daily, or just once? There is no such thing as being too careful here. Also bear in mind that your rule could run at any time during the hour you’ve set. So if your sale ends at 2:00 p.m., and you don’t want sale ads potentially still live at 2:58 p.m., then leave yourself an hour’s grace at either end. Nothing is surer to annoy a client or boss than overspending, but it is often and easily done. Speaking from experience, an account manager could, at any one time, be managing several clients and hundreds of different campaigns. This makes it almost impossible to manually keep track of budgets and spot potential overspends yourself. Instead, you need to make budget tracking as simple and automated as possible so that it can be monitored easily and excessive spending reined in quickly. By creating a script to export month-to-date spend into a Google doc, in combination with some simple Excel formulas, anyone can have a budget-tracker document for each client. It looks at previous spend and calculates projected spend for the month, giving you an indication of whether you need to increase or decrease spend. If you work to an overall budget, it can be very top-level, or you can work to specific budgets for different campaign types, as long as you use consistent naming conventions across all campaigns, e.g., if you have a budget for remarketing campaigns which you need to keep track of, make sure “remarketing” is in the name of every campaign that needs tracking. One mistake certainly doesn’t make a bad account manager. Unless you’re reading this on your first day, you’ve probably been there yourself. But there are small changes we can all make to ensure those little mistakes are happening much less often. Using a combination of care and attention, automation and another set of eyes should help to keep your campaigns in check and make for a happier workplace.